You want to have fun on every RV adventure you take. That means you want to avoid accidents and mishaps that will distract you from the activities you planned. Whether you’re a new RVer or a veteran, read our RV safety tips to keep yourself and your family safe on the road and in the campgrounds. 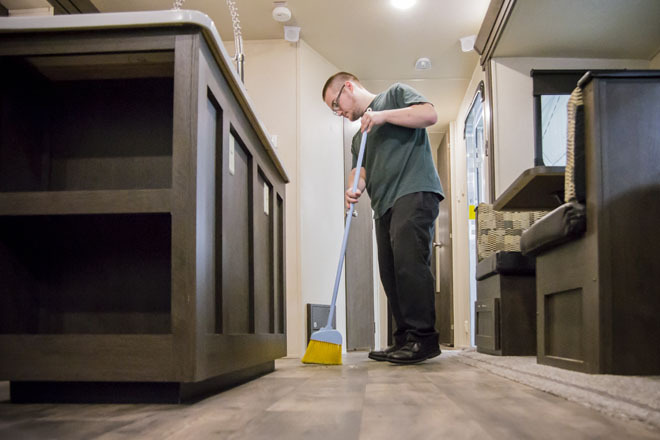 Every RV is different – and compared to operating a normal vehicle, they’re a completely different experience. Safe RVing requires you to understand your RV intimately. For new RV owners, driving an RV can take some time. While operating your tow vehicle or motorhome on the highway is easier than you think, maneuvering through side-streets and small one-lane roads can be a challenge for a new driver. Just like when you first got your driver’s license, it’s a great idea to practice driving around with your RV in a safe location. Without even being on the road, you can sit in the driver’s seat and take note of potential blind spots. Get a feel for the length of your RV as you move and how it responds to turns. Some campgrounds and roads are very tight, with trees or other obstacles along the way. 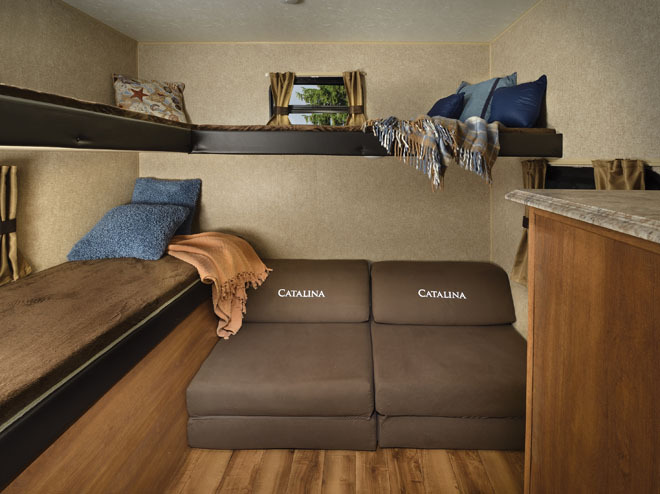 The more comfortable you get with your RV now, the less stress you’ll have when you’re out on the road for a real vacation. Everywhere you go, you’ll come across bridges or other low overhangs that your RV will need to safely clear. Trying to go under a bridge that you can fit through is a quick way to ruin a vacation. Not only should you know your RV’s height, you should be able to recall it quickly. This way, when you come across a low clearance sign, you’ll know well before you get stuck in traffic if you need to find another route. The weight rating of your RV is an important number that dictates the maximum allowable limit of weight for your RV. This includes the RV itself as well as everything in it: you, your luggage and any additional appliances or items you bring. It’s tempting to bring everything along with you on your trips. After all, your RV is there to give you a safe and comfortable retreat when you’re on the road or at the campground. But there are limits to what you can bring! When you purchase your RV, pay attention to its weight rating and specific ratings, such as dry weight. The dry weight of your trailer is the estimated or actual weight of the trailer with its standard equipment – essentially, before you fill the tanks and load your luggage. This weight gives you an idea of how much wiggle room you have to customize or pack before you hit the road! 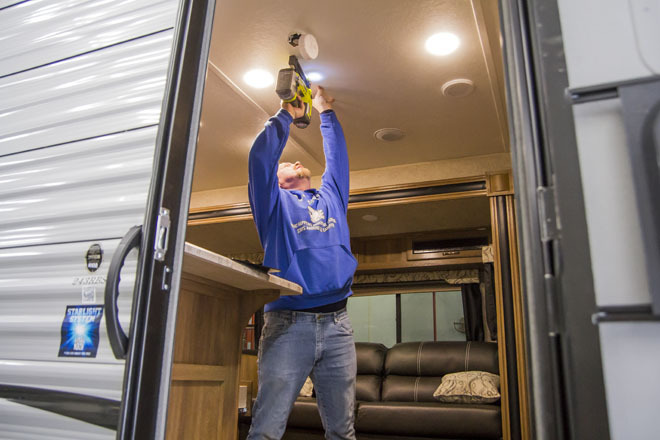 Regular maintenance helps your RV perform its best. Tires – Tighten the lug nuts and measure the tire pressure before every trip. Tire pressure can change dramatically as the weather shifts. Tires that are under or over-inflated can make your vehicle harder to control or even blowout completely. 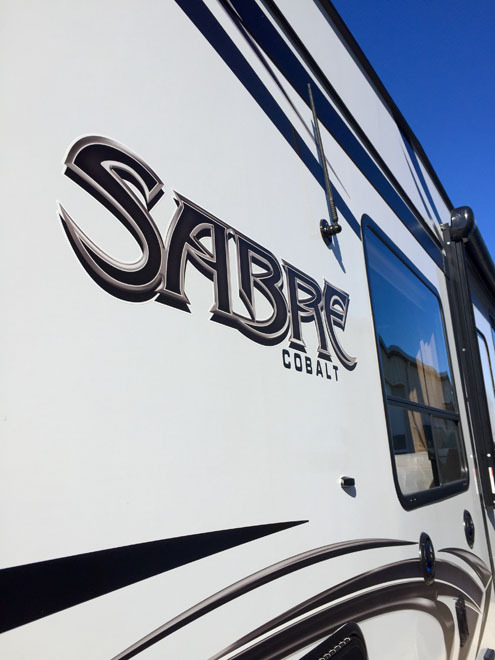 Batteries – A dead RV battery is a major issue when you’re already camping – this can happen due to age or electrical surges. Keep an eye on your battery for corrosion damage or wear over time. Remember that batteries will need replacing! Deep-cycle batteries used in towable RVs will start to lose capacity after three years. Start-type batteries used in motorhomes will lose capacity after five years. Brakes – Maintaining the brakes on your RV is critical for your safety and the safety of others. Even when driving in perfect road conditions, failing brakes can spell disaster. Add brakes to your annual check-list prior to camping season! Using your RV during a nice spring weekend isn’t the same as driving down an icy road in a snowstorm. 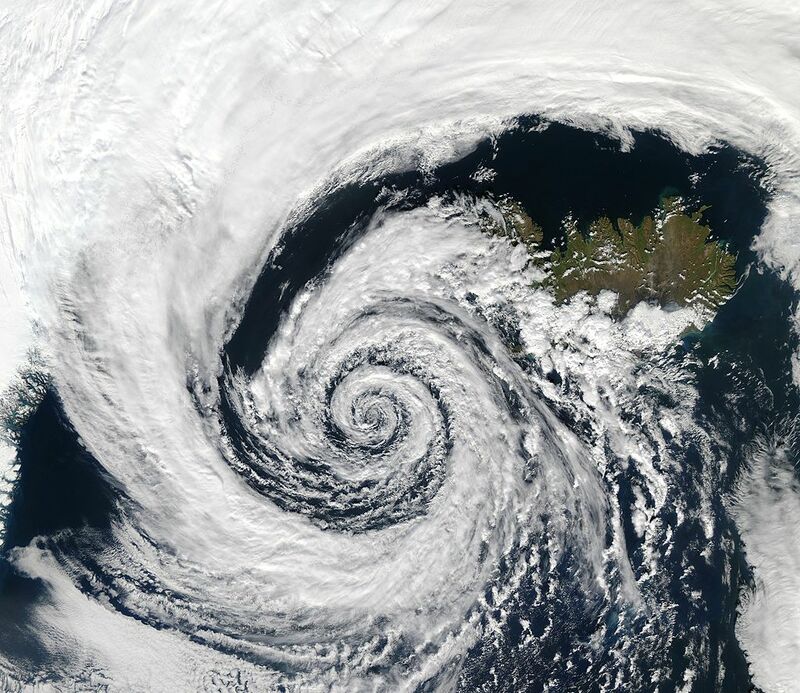 You can’t always predict the weather when you’re scheduling a trip, but you can prevent yourself from getting blindsided by a severe storm! Even if your weekend RV trip is happening in the middle of a beautiful summer, you may run into days where a heavy rain is expected. You may be an expert at driving your own truck, but hazardous roads are more hazardous with a heavier vehicle in row. The weight and size of an RV can make driving and camping in harsh weather difficult. Especially if you plan to go camping deep into the natural woods, remember that heavy rains can make dirt trails exceptionally hard to travel. The farther you travel from home, the more important it is to stay informed. You don’t always know what effects the weather conditions may have in a city or state you’re unfamiliar with. A long trip may require you to pack a lot of equipment. Forget to pack the bread or a few pairs of extra clothes? No big deal. But if you’re away from home and have other important needs, you need to be sure that you’ve packed them. A packing lists helps ensure you remember to bring everything. These types of items keep you safe on the road no matter what you run into. You don’t want to end up in the middle of the woods without them – so in addition to your normal checklist, make sure these items are always listed and accounted for! Every national park and forest has its own wildlife. They’re all generally safe to travel, but certain parks are homes to territorial wildlife such as bears, wolves, buffalo or wild cats. You may also happen across scorpions, snakes or other small threats too. When you trespass near their territory, you put both the animals’ lives and your own at risk. Before you hit the road, take a few minutes to research the wildlife of your destination to know what to expect. This information can help you identify signs of wild animals and even give you safety tips in case you meet one face-to-face! Fortunately, an RV is far safer than a tent to protect yourself from roaming wildlife. You still want to keep a clean camp, though. Left-out food or drinks can lure animals just outside your RV. Being greeted by a bear at your camper door doesn’t sound like a great camping trip! Whether you’re a solo camper looking for a private getaway or a family traversing the secluded backwoods of a national park, it’s important to stay connected to friends, family and emergency contacts. You may be used to constant Internet connections and mobile service, but they’re not always a guarantee the deeper off the grid you go. 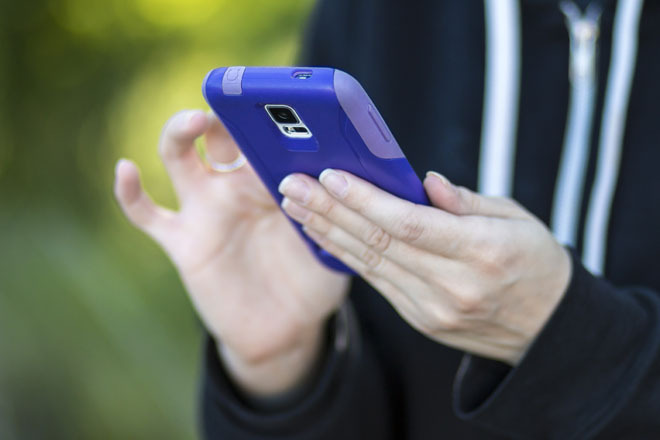 Plan your communications so that you aren’t left alone during an emergency. There are plenty of gadgets that help you extend the range of your Wi-Fi or keep you in contact with others even when your mobile phone isn’t getting a signal. These are critical tools for dry campers and other adventurers that stray from the populated camps at the major parks. If you plan to go on a longer trip, it helps to establish scheduled check-ins with someone else. These check-ins let everyone know you’re okay, and make sure that someone is aware of a potential problem if you don’t contact them in time! 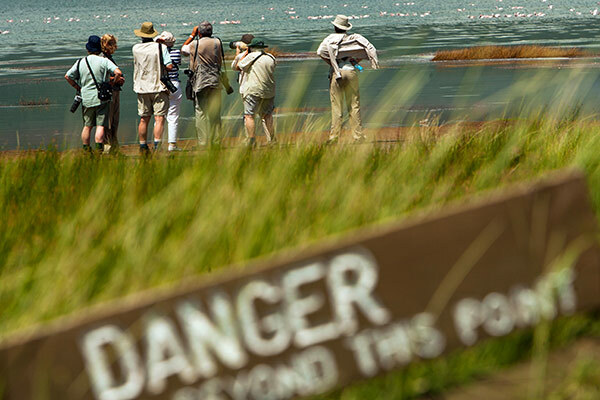 In most cases, these contingency plans won’t be necessary – after all, the national parks are well-staffed and most areas are well-traveled enough to make it unlikely that you won’t come across new faces as you camp. But it never hurts to stay safe! Are you ready to buy an RV and travel the country? The professionals at RV Wholesale Superstore are ready to help you find the perfect RV for your budget! Visit us in-person at 5080 W. Alexis Road, in Sylvania, OH or call us at (866) 596-7767.